"Quick, which has been the hottest investment since 1982, stocks or Treasury bonds?" Bond guru Gary Shilling asked that question back in 1999 – while the dot-com boom was in full swing. Stocks returned 20% a year over that stretch (with dividends reinvested). From 1982 until the dot-com boom in 1999 was probably the best 17-year period for stocks in all of history. Nothing could have beaten stocks during that time – right? It turns out, a simple Treasury bonds strategy did. No kidding. The simple, stock-beating strategy was to buy a 25-year Treasury bond and hold for one year. Then, you'd sell it, roll the proceeds into a new 25-year Treasury bond, and hold for one year again. "But Steve, why are you telling me this?" you might be thinking. "You can't make 24% in a year in Treasury bonds anymore." In a Bloomberg article yesterday, he explained that if interest rates on government bonds drop "from the current area of about 3% to my long-held 2% target in 12 months," then the total return will be 25% for a 30-year Treasury bond... And a zero-coupon 30-year Treasury would return 33%. Yes, that's a 25%-33% return in Treasury bonds in just one year. Shilling concludes: "Where can you find comparable investment prospects?" Last week, I told you that Bill Gross – known as the "Bond King" for his decades of great calls on interest rates – says we should expect interest rates in long-term Treasury bonds to stay around 3% for the rest of this year. And most investors expect higher rates than that. But I agree with Shilling – at least in the short term. In my True Wealth newsletter, we recently made a big bet that interest rates on long-term bonds will go DOWN this year – not up. So far, subscribers who have followed our advice are making good money on this trade. "But what about all the government spending, Steve?" It's a fair question. The U.S. government is $20 trillion in debt. If it can't pay it back, investors would lose confidence in government bonds, sending interest rates dramatically higher. The only question is, when will this happen? Don't get too concerned. With inflation likely to remain low and Treasurys continuing to be a haven for domestic and foreign investors, financing the expanding federal debt should continue without major problems. A key point here... In my True Wealth letter, we're not making a long-term bet. Instead, we're putting on a trade over a few months. Investors are almost unanimously betting against Treasury bonds. They are nearly unanimously betting on higher interest rates. Only Shilling and I disagree with the crowd. I believe we have big gains to come in our bet on lower interest rates over the next few months. If you are betting on higher interest rates today, you need to realize that you are part of a crowded trade. And when a trade gets this crowded, the consensus is usually wrong. Looking years ahead, I get it – it's a scary picture. The U.S. government is heading ultimately toward a debt crisis, with dramatically higher interest rates. But that scenario is likely years away. For the next few months, my money is on lower long-term interest rates. "The Fed is lying to you," Steve writes. The Federal Reserve has said it will raise short-term rates to 3.4% by 2020... But Steve and the "Bond King" disagree. Learn more here. "The rate hikes in 2000 and 2007 led to major stock market crashes," Steve says. To learn how close we are to history repeating itself, read more here. Steve has been bullish on real estate since 2011, after the housing bust crushed prices. Now, the market has made a huge comeback. Home inventories are tight... And demand is rising as a result. Homebuilder stocks soared last year, including KB Home (KBH), PulteGroup (PHM), and NVR (NVR). 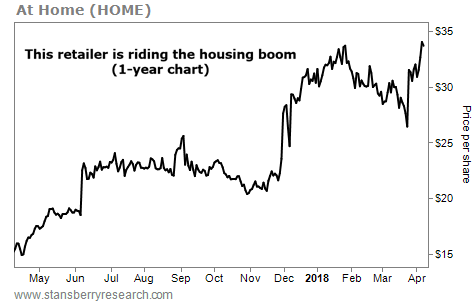 Right now, we're seeing another bullish sign for housing – rising shares of home décor retailer At Home (HOME). The company has about 150 superstores throughout the U.S., where it sells furniture, home textiles, housewares, and more. And with more than 50,000 unique products, it's achieving its goal to "out assort" the competition. At Home is one of the fastest-growing retailers in the country... Last year, its sales jumped 24% from a year earlier to $951 million. Meanwhile, sales at its competitors' stores were only up 3.6%.